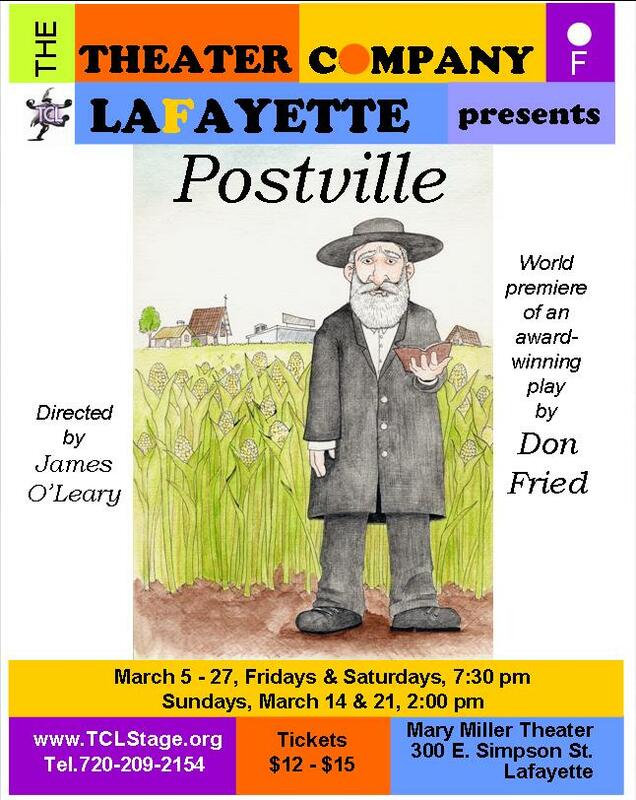 Postville had three readings: one at StageWest in Des Moines, in March, 2009; one at the Theater Company of Lafayette in August, 2009; and one at the Playwrights Showcase of the Western Region in August, 2009. The play was produced at the Theater Company of Lafayette in March, 2010. Gabe, Ray and Rhonda, three residents of the struggling small town of Postville, Iowa, are engaged in their daily ritual of sitting in front of Dorinda’s Café and talking about the weather. Jonathan, a big-city newspaper reporter turned college journalism professor arrives and immediately clashes with Rhonda, who runs the local newspaper. Then, to the locals’ astonishment, Avram and Moshe, two Hasidic Jews from Brooklyn, appear and announce that they intend to re-open the nearby, shuttered meatpacking plant as a kosher facility. The people of Postville think that their troubles are over. But from the newcomers’ reactions to a well-meaning welcome picnic, it is evident that the cultural divide between the Hasidim and the town’s long-time German Lutheran residents will be difficult to bridge. And while the opening of the plant brings some of the expected economic benefits, those benefits are accompanied by the problems which often come with rapid growth and increased racial and social diversity. Although some of the Hasidim are settling in – Avram’s wife, Chanah, starts work as the Jewish columnist for the Postville newspaper; and Moshe’s wife, Leah, opens a kosher delicatessen – relations between the groups are generally tense. But the tension is not only between groups; Gay, Ray and Rhonda fight among themselves, and Moshe and Leah’s marriage shows the signs of strain. The situation comes to a head when Ray proposes a voter referendum on whether to annex the land on which the plant is situated. Annexation would bring an increased level of control, a symbolic first step in the assimilation which the Hasidim have been strongly resisting. On the day of the referendum, Immigration and Customers Enforcement officials stage a raid on the plant and things explode, figuratively and literally. In the aftermath of the raid, the longtime and new residents of Postville come to terms their new situation. Can the town survive economically? Will families manage to remain together or will they break apart? And the people of Postville, members of groups that have been set in their ways for decades or centuries, will they bend or break under the seemingly irresistible pressure to change?